For more than three decades. Instant Marine has earned the reputation as a top Illinois boat docks company in Illinois. Our Illinois boat dock company manufactures and distributes Illinois boat docks, floating boat docks and portable boat docks for Illinois marinas and Illinois boat piers for Illinois marinas. Instant Marine Illinois Boat Docks are popular throughout the entire state of Illinois. Instant Marine custom manufactures Illinois boat docks, marina boat docks, floating boat docks and commercial boat docks for Illinois marinas and boat docks for Illinois lake homes, cottages, cabins, vacation homes, resorts and commercial marinas on inland lakes in Illinois. Our Illinois boat docks company ships floating boat docks direct to Illinois marinas. Series 500 Floating Boat Docks For Illinois Marinas The perfect marina boat docks Illinois are designed to be located near deep, fluctuating or soft bottom lakes in Illinois. Instant Marine Illinois boat docks for Illinois marinas feature a modular design that comes in standard or can be special ordered as custom boat docks in several sizes and height options along with 3 decking choices. Series 500 Stationary Boat Docks For Illinois Marinas. Our famous stationary boat docks Illinois and custom boat docks Illinois, Illinois boat piers and systems set the standard for portable boat dock design for Illinois marinas. 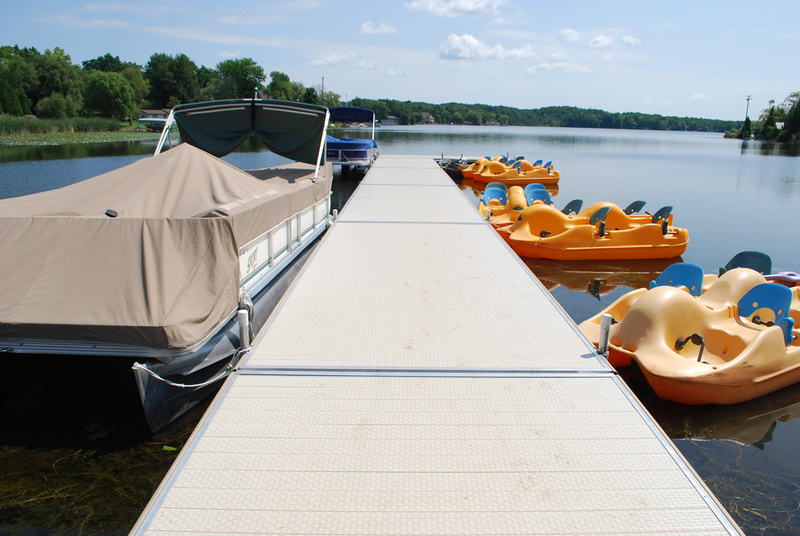 Its lip-lock connection allows for the quickest and easiest installation of Illinois boat docks in sectional docking. The double trussed internal telescoping leg stands and the built in vinyl rub rail combine for the best locking and strongest Illinois boat docks available for Illinois marinas. Series 400 Stationary Boat Docks For Illinois Marinas. Our Illinois boat docks company provides great looking Illinois boat docks and low maintenance all at an economical price. Instant Marine an Illinois Boat Docks Company also manufactures stationary boat docks Illinois that feature fluted side rails, cross arm assemblies and legs. Our aluminum boat docks are designed for Illinois marinas are made of corrosive resistant aluminum with your choice of augers or pads for feet. Small Hydraulic Boat Lifts For Illinois Marinas. Instant Marine an Illinois Boat Docks Company manufactures and distributes Illinois hydraulic boat lifts that allow Illinois boaters to enjoy fast, effortless lifting making our small Illinois hydraulic boat lifts the most convenient on the market. Illinois Boat Docks Company Instant Marine distributes small hydraulic boat lifts that offer quick, quiet operation that lifts smaller boats out of the water in 26 seconds. For more than three decades, Instant Marine Illinois boat docks have covered the waterfront in Illinois with world-class boat docks for marinas. Our Illinois marina boat docks feature eye catching designs are available in both commercial boat docks and residential boat docks applications. Our Illinois boat docks company first began in 1977. Instant Marine manufactures Illinois boat docks and distributes Illinois boat docks, portable boat docks, floating boat docks, residential boat docks and commercial boat docks for Illinois marinas. Instant Marine Illinois boat docks are the original innovator of the continuous built in vinyl bumpers, standard in all Series 500 commercial boat docks for Illinois marinas. During the past 30 years, it has been our passion to develop top quality Illinois boat docks that are easy to use while enhancing the appearance of your Illinois shoreline. Whether your Illinois boat docks site is more suited for portable boat docks, stationary boat docks, floating boat docks Illinois, or custom boat docks Illinois, no one gives you a better selection of quality Illinois boat docks in Illinois than Instant Marine. Our Illinois boat dock company offers commercial boat docks for Illinois marinas in four decking options (vinyl boat docks Illinois, aluminum boat docks Illinois, cedar boat docks Illinois or treated pine boat docks Illinois) available in four vinyl colors: white boat docks Illinois, beige boat docks Illinois, chocolate boat docks Illinois or gray boat docks Illinois with four built-in bumper colors: white, beige, cobalt blue or hunter green. Instant Marine a top Illinois boat dock company realizes and appreciates the investments you have made in your commercial lakeshore property, and we welcome the opportunity to assist you with portable boat docks Illinois, floating boat docks Illinois and custom boat docks Illinois and Illinois boat docks for Illinois marinas. For more than three decades, Illinois boat docks company Instant Marine floating boat docks now cover the Illinois waterfront with the highest quality commercial boat docks for Illinois marinas. Instant Marine provides quality Illinois boat docks Illinois, custom boat docks Illinois, Illinois boat piers, portable boat docks Illinois, commercial boat docks Illinois for marinas and Illinois boat docks for inland lakes in Illinois. Our commercial boat docks company Illinois and marina boat docks Illinois can be ordered as floating boat docks to meet the custom needs of any Illinois marina. Illinois Boat Docks Company Offers 30 Years of Excellence.